Our holiday travels took us through Madison WI this week, which gave us a a chance to dine again at Harvest. The restaurant has a small and elegant bar, with a cocktail list that matches the kitchen’s reputation for interesting flavors and careful presentation. The house cocktails are all designed by proprietor Tami Lax; some are new inventions, some personalized expressions of the classics. This time I sampled the Amargo Cocktail, one of Lax’s originals. 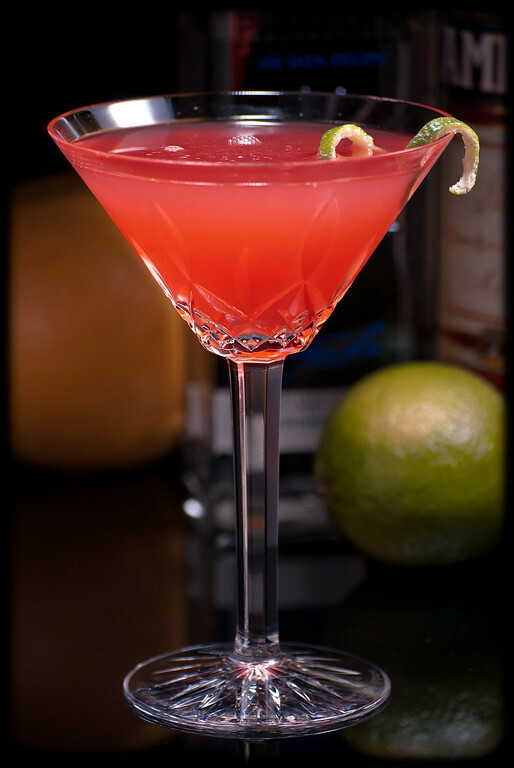 Given its name, it is not surprising that this is a Campari and tequila drink, with a heady dose of citrus to top it up. Harvest makes this drink with Corralejo Blanco tequila. The Corralejo seems to be unavailable in my region right now, so I used El Tesoro Platinum, which substitutes very nicely. I haven’t tried this recipe with aged tequila, but I suspect that the young blancos are the proper choice for this drink. Combine ingredients and shake with ice until very cold. Strain into a chilled cocktail glass. Express and garnish with lime. The hefty dose of Campari assures a delightful pale red color. The nose is lime from the garnish. As for the flavor, Harvest’s version is all about lightly smoky tequila and Campari, with the citrus taking a very quiet ride in the back seat. The version I make with El Tesoro lets the lime come forward more prominently; perhaps it’s the tequila, perhaps it’s the limes themselves that make the difference. I like the drink either way, but I prefer the more Campari-and-tequila-forward version, so with the fairly pungent limes I have available currently, I’m cutting back the lime portion a little, closer to a quarter ounce. “Tequila and Campari—the Amargo Cocktail” at cold-glass.com : All text and photos © 2011 Douglas M. Ford. All rights reserved. This cocktail looks really tasty both in recipe and picture. I`m a huge fan of Campari so of course i`m gonna make this! Yeah, this one did some serious harm to my tequila and Campari supply over New Years. And I had sort of gotten away from grapefruit juice, so it was fun to reintroduce it to the repertoire. I really like grapefruit juice and with both tequila and campari its just made for and its fresh! It’s interesting to ponder where the real danger lies. This looks so good that I decided to try and make one today. Trouble is that Campari just wasn’t in my cabinet, and I’m not too sure I would find it at the local liquor store. So… I used Angostura bitters, only about 1/4 as much. Things didn’t turn out well, (Herra Dura Repassado) was the tequila I used. That’s a tough one. I don’t know of anything that can properly substitute for Campari. I’ve seen a couple references to using Gran Classico amaro, but I’ve never even seen that product and I have no idea if it’s a flavor analog; besides, I’d guess that if your retailer doesn’t carry the ubiquitous Campari, you won’t see Gran Classico either. Which gets us back to do-it-yourself Campari substitutes. It’s interesting to consider that there might be a way to combine other off-the-shelf products, but I suspect it would always be a mixture of some other amaro or amaros, plus some combination of common bitters, but then you’re having to stock products that may be even harder to come by than Campari, and still not getting the gorgeous color, nor the intended alpha dog flavor that seems to combine so delightfully with tequila in this drink. It’s an interesting challenge. If you figure it out, I’d love to know the answer. If we’re lucky, someone will add some good starting ideas here. I ended up using 7/8 oz Dry Vermouth and 1/8 ounce of Angostura Bitters. The resulting cocktail was actually quite nice, but it probably was not close in flavour to yours. It was however nice enough that I served it to a couple of friends, who turned their noses up at it as soon as they spied the Tequila bottle on my counter (Herencia de Plata Reposado this time). Oh well! I will search out some Campari and do some further testing. I can’t wait to try your substitution to see what it’s like. It’s a very clever substitution, and it’s fun to know that it makes a good drink. Alas! for your friends’ experience with tequila; perhaps another day, when their history is richer. That looks so beautiful. I really like tequila paired with citrus so I need to try this! What an incredibly balanced and refreshing drink! I was very dubious about mixing grapefruit juice with Campari. I was certain it would be too bitter for me, but the tequila added just enough sweetness to make it perfect. Thanks! glad that you managed this spam issue. i like you blog very much. I’m glad you enjoyed the Amargo. I agree, it does deserve some wider appreciation. Had a cocktail 20 years ago in a Madrid cocktail bar which was immediately behind a milk bar on one of the main roads in the centre, just across from the old Liberal Club. It was tucked away behind in a very narrow sevice road and seemingly had been the welcoming room of a bordello during Franco’s years. It was by then a classy cocktail bar and on its menu was a drink I had not heard of before or since. It was called Admiral “something or other”. Needlesss to say I thought I’d rememeber the name but well to tell the trurth I may have forgotten as soon a I had ordered it. Anyway I was bowled over by it. It was so dry so salty so subtle. It was simply one shot of tequila with one shot of campari over ice served in a coctail glass with salt around the rim. I have gone on to drink this in many bars all over the world and nobody has ever known it or its name. Note, it had no additives or flavourings such as fruit in it, it was bald with the ice having been dispensed with before the drink was placed in the salt rimmed glasses. One night in Los Angeles I had ordered it and before I knew what was happening the whole bar had asked after it and started drinking it. Another night in Hull, of all places, the same happened. And it’s not to be taken lightly. Remember in The Thin Man an incident in a bar with Dry Martinis, when his wife comes in from shopping and asks him how many he’s had and responds by asking the barman for that many in the one glass. Well such such nights can easily be started by those indulging in this fine example of a dry, salty serious drink! Yes, Sandy, I do remember that opening scene from the Thin Man, it’s one of my favorite movie scenes ever—especially Myrna Loy’s remarkable pratfall as she comes into the bar. So tequila and Campari, sounds like an interesting drink. I’ll have to give it a try. Thanks for the great story.